Ceramic tile without any kind of assisted heating or using radiant heat can be profoundly cold in winter months. While there are many pros and cons of wood flooring versus tile it may actually boil down to what appearance you are actually seeking. While hardwood for many feels more comfortable or cozy underfoot, ceramic or stone can be very hard on the feet and backs (due to the denseness) especially in areas where standing for long periods of time are considered. Depending on where you live, ceramic tile is generally lower in material costs. Installation costs in recent years have shown proper hardwood installations to be more expensive due to the amount of floor preparation that is vital to any successful long lasting floor. 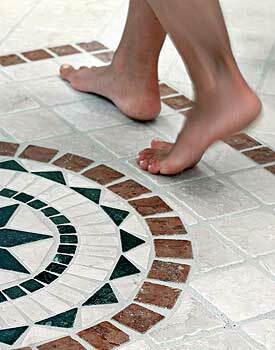 Tile installers generally do not pay attention to minor dips in subfloors, instead allowing more thin set to offset the differences. Wood floors require more care not only with regular maintenance after the floor has been laid, but it can sometimes become a scheduling problem with builders. During the construction process ceramic can be installed virtually any time. It can withstand most of the everyday pounding caused by other trades that are working, providing it has been given enough time to set. Hardwood on the other hand should be installed very near the end of any work that is going on. Damaged floors prior to move in dates are often problems with builders who have very little experience working with wood flooring. 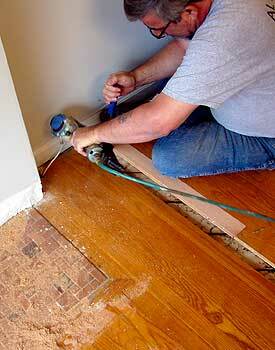 Tile and wood floors are a tossup here but does depend on what type of repair. Often with tile floors finding matching tiles can become a huge issue whereas wood floors are much easier if they’re the sand and finish variety (shown). Prefinished hardwood repairs can create problems much the same as tile due to the changing design trends as products do get discontinued from time to time. Whatever is chosen, it’s always wise to order more than needed and keep leftovers in a safe dry place. Ceramic is the loser on this end when it comes to grout lines. They can become a huge issue unless they are sealed keeping stains from permanently effecting grout colors. 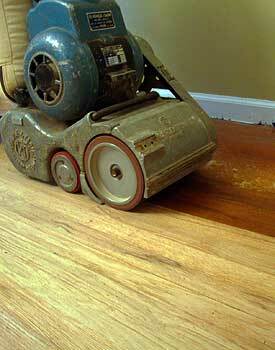 Conversely, wood floors only require light sweeping and swiffering on a regular basis. Colors chosen for either floor type will also have an impact on the everyday cleaning needed. For those that may reside near sandy areas or your household is not the kempt type, ceramic wins hands down on this one. Grit and sand has an adverse scratching effect on hardwood but can be reduced by using area rugs in and outside the main entry areas of the home. Unlike hardwood when something heavy is dropped, most ceramic can chip or crack; but can vary on product and installation quality. Replacement becomes necessary. Wood floors on the other hand may show dings and dents but some often write it off as adding to the character over time. Most hardwood floors (engineered has their limitations) can be revitalized to their original new appearance should the floors become worn, dull, scratched, or damaged extensively. As trends and color popularity changes, wood floors can change color too. Ceramic on the other hand has to be removed for the most part, but can be tiled over. Disadvantages of installing new over old can create a difference in height for other focal points of the home such as baseboard and kitchen appliances.